Ueberschall's Electrolines is a further volume in their popular Liquid Instruments series. We've looked at a number of these — most recently, Score FX in SOS March 2009, and going as far back as Derek Johnson's SOS February 2006 review, in which the Melodyne‑powered front‑end is explained in more detail. Suffice to say that this approach makes the supplied phrases much more versatile than the quantity alone might suggest. 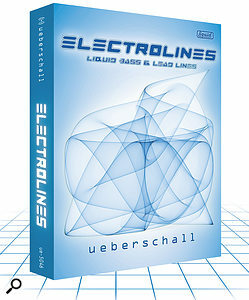 As indicated by the name, Electrolines is primarily a collection of bass and lead lines. The 800MB of material is organised into 78 'themes', with original recording tempos that tend to cluster around a club‑friendly 130bpm. These themes are not construction kits, but instead contain multiple versions of a single melodic phrase, with each version played using a different synth sound or with different processing applied. The sound sources themselves sound big, fat and analogue and, given the musical target (serious club‑orientated Techno, Hard House and Trance, for example) they're spot on. The processing, including the application of lots of different filtering, means there's plenty of variety in the sounds in a particular theme. The basic sounds go from thumping bass through to aggressive leads, with some of the themes containing as many as 20 variations. Indeed, some of the sounds are pretty extreme — so if you do audition, take care with your playback levels or you might find your speaker cones flapping on the floor. The playing is equally extreme. While a small number of the themes are gentler in nature, in general, the 'melodic' content is challenging; this material is not going to find its way into too many romantic love songs. Less obviously melodic material by Tiesto or Underworld, for example, might get you into the right ballpark and, in the main, I would think the material is more obviously suited to tracks aimed at clubs rather than at the mainstream commercial music charts.